The Cuyahoga Falls Friends of the Library Sale was this past Friday and Saturday and like last year I made sure I stopped by. It’s funny, when I got home for some reason I was a bit disappointed. 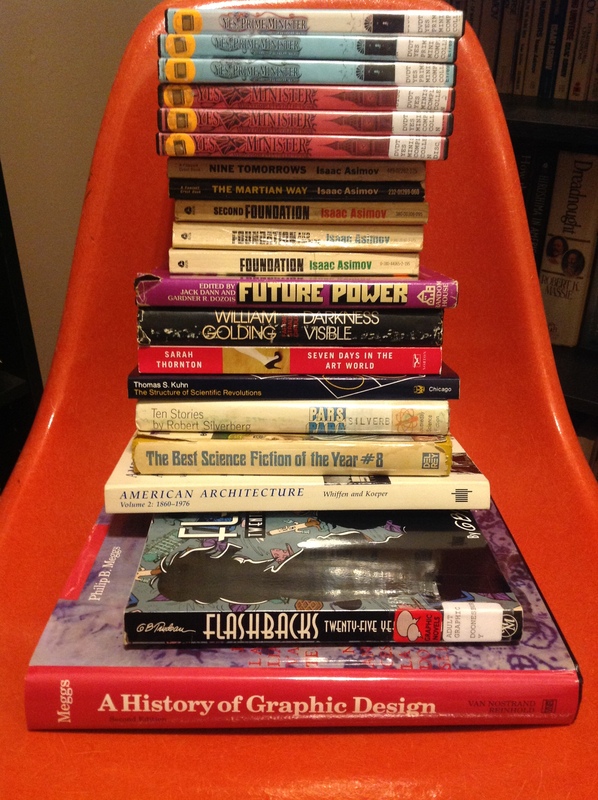 Unlike previous years I didn’t bag a ton of science fiction story collections and I didn’t find a really singular, amazing book like The Codebreakers, or one of Asimov’s Opus books, or the Robotech novel set I’ve found in previous years. However, tonight I was unpacking the books I bought and I realized I was totally wrong: This was a fantastic haul! What you see here cost me a total of $11.20. $5.20 for the books and $6 for the DVDs. I think two of these books might have also come from a trip to Goodwill later that day, but I can’t remember for sure which ones. I think it was two of the hardbacks. At the book sale the science section is close to the entrance so the first thing I found was Thomas Khun’s The Structure of Scientific Revolutions, a classic book about the development of science that I’ve heard a lot about but never actually read. From there I cruised to the science fiction section and spotted a some good Asimov stuff. When I was there, near the end of the second day there was what I think was an entire set of the Foundation series (the books from the 50s and the books we wrote later). I’ve recently gotten into finding older versions of books I already own so I picked up the first three books. The two Asimov short story collections are two that I don’t think I’ve seen before. Nearby was the graphic novel/comics section, which by that part of the day was almost empty. However, I found the Doonesbury Twenty-Five Years collection which will go nicely next to my Bloom County and Calvin & Hobbes collections. I’m not a great fan of Doonesbury today but looking through the collection it had a great biting vitality in the 70s and 80s. The room at Cuyahoga Falls Library where the sale is held is very cramped on sale day. The low ceiling, poor lighting, narrow aisles, and close quarters have in previous years made me want to leave as soon as I looked over the SF section. This year though, we came at about 2:00PM which is before the mad dash for the bag sale begins and the crowds were somewhat more manageable. This left me free to look over other sections at my leisure so I spent some serious time at the Art section, which is where I found A History of Graphic Design, American Architecture 1860-1976, and Seven Days in the Art World. I’m most excited about A History of Graphic Design which is apparently an authoritative overview of graphic design. Graphic design is one of those subjects I don’t know much about, but it appeals to me on aesthetic grounds. That book is just fantastic to look at. The real treat though, was in the room where they sell more “expensive” (i.e. greater or equal to $1) items where I found almost all of Yes, Minister and Yes, Prime Minister which as a classic piece of 1980s British TV comedy, is dear to my heart. Disc one of Yes, Minister is missing but I’m still immensely pleased. It was astonishing to find such great British TV sitting there for $1 per disc. The appeal of the Library Sale is the possibility that you can pick up things for cheap that ordinarily would be very expensive. The graphic design book and the Yes, Minister sets certainly fulfilled that promise for me. I think this was my fourth or fifth Friends of the Library Sale and this go-round has convinced me even more that the people who contribute books have fantastic taste. The sale is a jewel and I’m looking forward to the Fall sale in November. I went to the sale, too. They really do have a great selection, though like you, I was ready to go fairly shortly in; too many people, too cramped. Nevertheless, I picked up a BIG load of Robert B. Parker books I didn’t have, and any time I can build up my collection in large chunks at such low prices is a-ok by me. Didn’t find many movies I wanted, though an ancient VidAmerica VHS 3-pack boxset of King Kong – Citizen Kane – Gunga Din for only a buck was a definite must-buy for me.